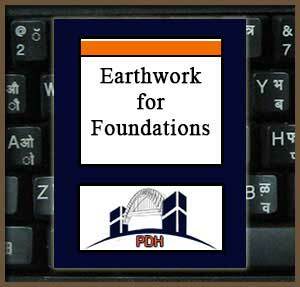 This course provides an introduction to earthwork for foundations. In general, excavation for subsurface structures will consist of open excavation and shaft and tunnel excavation. Where excavation to great depths is required, a variety of soils and rock may be encountered at a single site. Soils may range through a wide spectrum of textures and water contents. Rock encountered may vary from soft rock, very similar to a firm soil in its excavation requirements, to extremely hard rock requiring extensive blasting operations for removal. Groundwater may or may not be present. The groundwater conditions and the adequacy of groundwater control measures are important factors in excavation, in maintaining a stable foundation, and in backfilling operations. The extent to which groundwater can be controlled also influences the slopes to which the open excavation can be cut, the bracing required to support shaft and tunnel excavation, and the handling of the excavated material. Learn about problems encountered during excavation related to groundwater conditions, slope stability, and adverse weather conditions. Learn the importance of accurate daily records such as of the quantity of water removed by the dewatering system and of the piezometric levels in the foundation and beneath excavation slopes. Learn the importance of protection of exposed earthwork materials.. Learn the importance of checking exposed rock by a slaking test. Learn how to minimize problems associated with the compaction of backfill by following good backfilling procedures. Learn about open-zone compaction ofcoarse-grained soils that exhibit slight plasticity (clayey sands, silty sands, clayey gravels, and silty gravels) using either sheepsfoot or rubber-tired rollers. Learn the general rules for lift thickness. Learn guidelines for earthwork operations in freezing temperatures.. This course is intended for civil and geotechnical engineers and other infrastructure design and construction professionals who want an introduction to earthwork operations for foundations of buildings and other structures. This course will introduce you to basic considerations when addressing excavation And backfill operations for structure foundations.. Upon completion of this course you will have an understanding of guidelines and approaches to earthwork operations for foundations of structures.